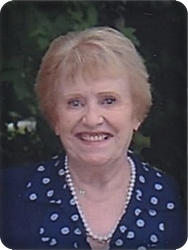 Susan A. Letherby, age 79, of Grand Rapids, was called to her heavenly home on Sunday, February 3, 2019. Susan was born in Traverse City, graduated from the University of Michigan and was an avid U of M football fan. She loved spending time with her grandchildren. She enjoyed reading, Broadway plays and was an animal lover. She was a teacher and worked many years in the insurance industry. Her parents, Garland and Grace House, preceded her in death. She will be lovingly remembered by her children, Mike (Becky) Letherby, Frank (Anne) Letherby, Cyndee (Ken) West; grandchildren, Ryan (Michelle) Letherby, Rachel (Quentin) Rogers, Erin (Ryan) Van Putten, Adam Letherby, Mackenzie Letherby, Brandon West, Noah West, Cassidy West; great grandchildren, Emerie, Logan, Mikayla; sister, Elizabeth (Walter) Nagel; and brother, Robert (Patricia) House. Visitation will be held on Wednesday, February 6, from 3 - 4 pm at Stroo Funeral Home, followed by the funeral service at 4 pm. Memorial contributions may be made to Spectrum Health Hospice.